1. Please introduce yourself – name, where you are from, family, pets etc. I am Beth and I live in Illinois. I have one wonderful husband, 3 children - 2 boys in college and a daughter who is a senior in high school. Almost an empty nester! My daughter has a cat that loves me, although I only like it. 2. How long have you been stitching and how did you start? 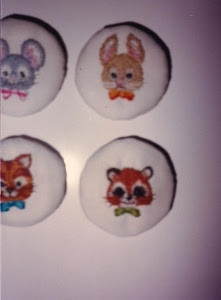 I have been stitching since I was around 6 years old. My mom purchased stamped scarves for my sister and I. My sister took a few stitches, crumpled it up and threw it under the bed. I made several and then taught myself crewel. I still have a few of those pieces. I stopped stitching in college but started again after graduation. 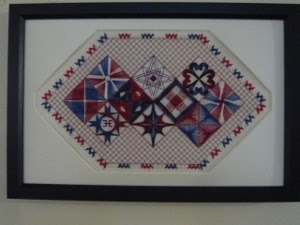 When I married, we moved to the Twin Cities in Minnesota and I discovered the Embroidery Guild of America. A whole new world of stitching opened up for me! Group correspondence courses, workshops, national seminars! I have never looked back. 3. How long have you been blogging and what inspired you to start? Is there a story behind your blog title? I started blogging in May of 2010. I wanted a way to journal my stitching and it seemed like a great way to start. A lady who does not blog any more inspired me and helped me get started. 4. How would you describe your stitching style? Are you a serial starter, a rotator, a OAAT (one at a time), highly organised, random and eclectic, etc.? I like stitching whatever makes me happy. I do pilot stitch for ANG and that forces me to have a deadline, but normally, I stitch what I feel like getting done. I always have at least 3 projects in the works: a large project that requires time and thought, a medium project that strikes my fancy and a small project to carry with me. If I have too many projects started and around, I start panicking. I do like having a canvas piece to stitch as that is one of my favorite mediums. I do rotate through some of my larger projects as they get a little tedious. 5. Do you have a favourite designer or style of design you are drawn to? I love Gay Ann Rogers designs. She does canvas work and her instructions are wonderful. Her pieces can be challenging or very straight forward. I always learn something when I stitch her pieces. The other thing I love are geometric designs. Whenever I start a new one, my boys tease me about it. "Haven't you done this one before? It looks the same as the last piece you stitched." 6. Which piece are you most proud of in your collection? The piece I am most proud of is Elizabeth by Gay Ann Rogers. She was quite the challenge for me. 7. What has been your worst stitching disaster? I have a hardanger angel in my basement that I counted wrong. I was so angry I rumpled it up and threw it across the room. It is close to being done but I am off and yet I can't bear to through it away. 8. Which new technique would you like to try, either stitching, finishing or another craft? I think I am at the point where I want to get better at one of the many techniques I enjoy rather than trying a new one. But you never know! 9. Do you have a box of finished-but-not-fully-finished pieces? Or is everything FFO'd? What's your favourite way to fully finish a project and what do you do with them? I have lots of projects that need to be finished. I now know that I will always have projects that won't be finished. I like learning the technique and stitching the piece, but I don't necessarily want to hang it on my wall. 10. Which of your projects most represents "you"? I think the project that most represents me is the ANG Stitch of The Month that I taught to my guild. I stitched it 2 times and it has Hilton stitches that I love. 11. Tell us a secret about yourself. Or a joke. About anything! 12. Anything you would like to add? I stitch to enjoy myself. It is to relax and make something beautiful. My stitching is not perfect and I don't enter things to be judged. One day I may, but nothing is good enough right now. I try to stitch a little every day and make a little progress on my projects. I think stitching should bring you joy, If it doesn't, it is time to start another hobby. Nice to learn more about you Beth. Thanks Linda. I always love reading about other bloggers. 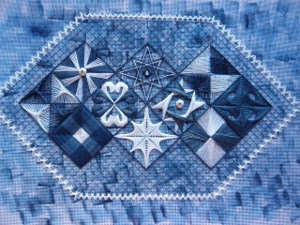 Nice meeting you!I haven't ever done hardanger or special stitches.AriadnefromGreece! Ariadne, you should try them as you may discover a new love! 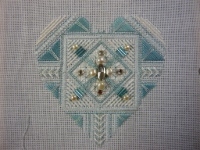 Hi Beth, so nice to read about your love of stitching. Glad you enjoyed meeting me as I loved writing it! Hello Beth, nice to meet you. The flowers or Italy is stunning and fabulous - well done. Glad you liked it. I really love Hilton stitches! Hello, Beth, it's nice to learn about your stitchy background . Your Queen Elizabeth is absolutely fantastic! Thanks! She took a bit to stitch, but I do love her! She was so much fun to stitch although quite the stretch. Hi Beth, nice to meet you! I ad admire your canvas work, I have not yet had the courage to try that! Canvas work is so much fun. Take the plunge! 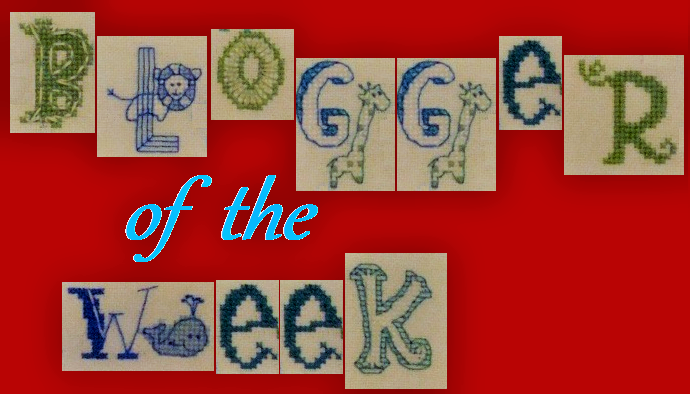 So nice to read about your stitching career and to see some of your embroidered pieces. They are just amazing. Thanks for your lovely comment! So nice to meet you Beth. Your work is beautiful and I really love the Malachite Heart! Malachite Heart was great fun! I hope to get a few more of Gay Ann's hearts stitched and hanging on my hat tree before next year. Lovely to read about your stitching Beth. Those speciality pieces are so intricate and neat! I love your Queen Elizabeth, what an amazing finish. Thanks! I love Gay Ann Roger's designs. Thanks Bethan. 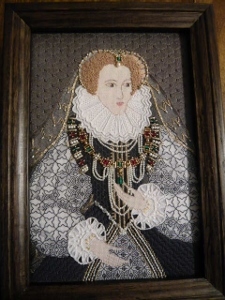 Elizabeth was so much fun and work to stitch. RJ-Thank you so much! My mom keeps threatening to steal Elizabeth! A Easter Blog Hop Extravaganza! Japanese Embroidery Phase 1 - Finished! QS Bubbles, Page 2 and 3 are Complete. After the Holidays and Into the New Year! Picture Window theme. Theme images by badins. Powered by Blogger.